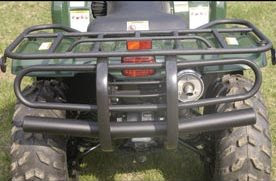 This Heavy-duty 2.5 inch bumper with bush bars and upper guard provides excellent rear end protection. The solid one piece design compliments our front bush bar. This accessory comes with all hardware and instructions. This prevents your bush buddies who follow too close from causing damage to your taillight and such like this unlucky machine below. To search for your Kodiak parts such as tail lights, fenders, seat, brakes, etc. and view microfiche browse our Yamaha parts pages. We still supply parts for ATV models from years ago.